Nick and 51.5 lber on fly! 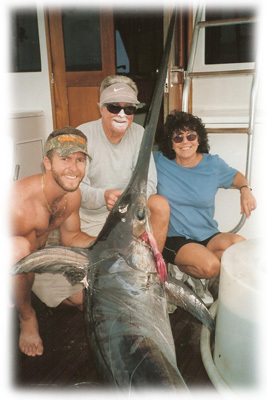 This was a MET Flyrod Record as well as a state fly record, 51.5 lb dolphin on fly! Angler Nick Stanczyk and mate George McElveen. Karen Stanczyk, with stepson Nick and a nice dolphin! Richard with a nice dolphin on light spin tackle, the good old days! Dolphin coming up to the side of the boat. Stick a gaff in 'em! Nice 47 lb Bull Dolphin! Caught aboard The Redfish! Johnny Johansen displaying a nice mahi! Capt. Scott Stanczyk & the crew of the Catch 22! Great action shot, Nick Stanczyk and mate Marc Ellis with a jumping dolphin! Nick & Colby with a nice dolphin! Mate Haines Salmone with his anglers and a nice catch of dolphin! Cappy Alex Adler and The Weez Jamie Allen with a huge bull dolphin! The Catch 22 crew on the way to the bahamas with a bunch of nice dolphin!!! Catch 22 crew with some yellowfin tunas! Johnny Johansen with a cool blackfin tuna and an excited youngster! Nick Belitz and a big blackfin tuna! Bill & Linda Pickering display some gorgeous blackfin tunas!